bforex offes a 10% bonus upon 1st deposit. The bonus can be immediately used to trade with and will be added to your account immediately. bforex sometimes also has reload promotions, getting you a bonus when you deposit again. There is no max bonus. 10% forex bonus over your first deposit that is immediately available for trading. You have to send an email to their 'Promotions department' to claim the bonus though. Clearing requirements: You have to trade 500 times the amount of the deposit in trading before you can cashout the bonus. That means that for every $10 in bonus, you will have to trade 5 mini lots of 10.000 units. This is better than most brokers. You can cashout your deposit at any time before clearing the bonus, but this will cancel the bonus. The principle for Mac users is the same as for windows users. However, since bforexl uses the Metatrader 4 trading platform exclusively, you will first need to know how to install metatrader on your mac. This is possible, but requires some work. more on this: how to use metatrader4 on mac. You create an account at bforex and deposit $500. You get $50 bonus immediately added to your account, so you trade with $550. There is no max to the bous, but you'll only get one for your 1st deposit. bforex does not have a webtrader. It offers the independent platform Metatrader and its own PROfit platform (windows only). It is therefore not very mac friendly. 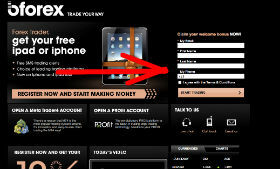 bforex also offers an iphone & iPad trading platform and the option of getting free trading alerts through SMS. Spread is typical, but minimum account size is rather high with $500, compared to other brokers. 3. Make first deposit and email Promotions Department. Bonus will be immediately added.